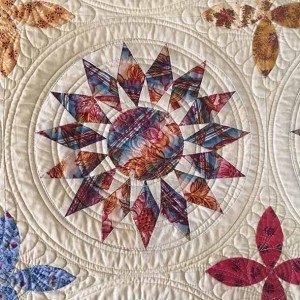 Learn to hand piece like a 19th Century Quilter, using time tested techniques. 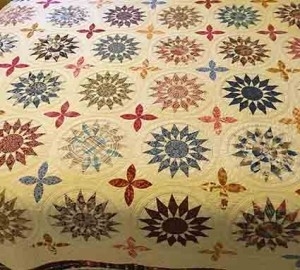 All of those vintage quilts that you LOVE but are too intimidated to make, will come into reach, after spending the day piecing with Margaret. Margaret hails from Elphinstone, Australia, a town of just 600 people, and lives in a converted 19th century train station. 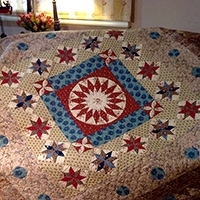 "A 19th century station is a great place for 19th century style quilts." Students choose a pieced quilt from Margaret's book for Quiltmania, Quilts from the Colonies..
Also, anyone who wanted to continue from the Rosa Biddelcombe applique class and make the pieced blocks from that quilt could join in as well. If you took a class with her last year, this is a perfect class to refresh your memory and trouble shoot with Margaret to move your project along.